Amico commercial grade light strings are made from heavy duty wire and have special weather-proof sockets that form a seal around the bulb string lights to keep water out. IP65 waterproof to protect the strand from rainy, windy, or damp climates in summer or witner. 2 x 52ft (104ft in total) long patio string lights with 18 bulbs included, 3 spare bulbs. With a bit of planning and a little thought placed into how you will hang your patio lights, you can create an outdoor living space that you will enjoy from day to night. UL Certified Weatherproof 2 Pack String Light: Amico outdoor string lights are bright enough without a glare so that you can sit back, relax, and enjoy the evening. The outdoor string lights create a beautiful atmosphere to mesmerize your family and guests with their nostalgic glow. 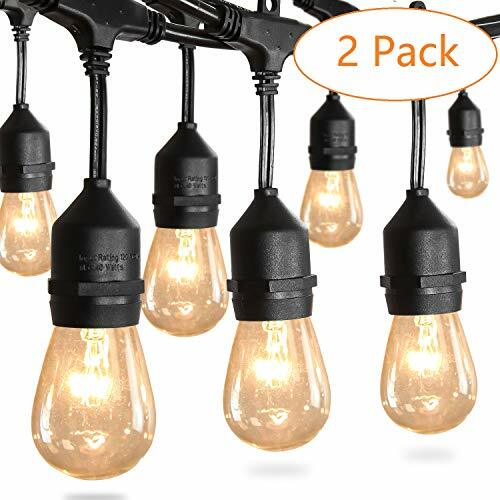 Widely Application: 2 x 52ft long patio string lights, 21 incandescent warm light bulbs with heavy-duty flexible rubber strand. Give you a wider range of lighting. You can connect up to 4 strands end to end to custom arrange your lights. Perfect for wedding, cocktail party, birthday party, BBQ, bistro, cafe, and so much more. High Quality Outdoor String Lights: UL certificated power cord for safer and durable use. The light cord is rubbery, flexible, and thick so that you can confidently leave these ultra durable commercial string lights on display during all seasons. IP65 waterproof to protect the strand from rainy, windy, or damp climates in summer or witner. 5-YEAR WARRANTY: Amico devotes to offering green, safe and smart life. All of our designs are inspired by our everyday life and customer feedbacks. Our company insists the quality check throughout, to provide good lighting products is always our mission. Your satisfaction is our priority - an unlimited warranty means we've got you covered. Easy and fast replacement is offered if any quality issue exists.